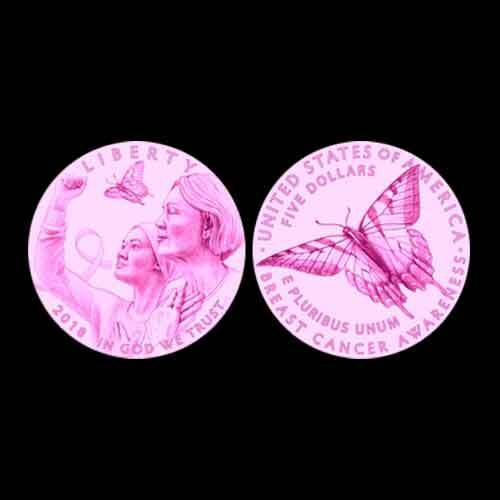 The cost of silver $1 and clad Half dollar 2018 Breast Cancer Coin Awareness commemorative was announced on 30th January by the US Mint. It’s going to be the first “pink Gold” coin to be issued by the US Mint. The gold $5 commemorative’s pricing is based on the Mint’s Numismatic and Commemorative Gold and Platinum Products pricing grid. The coins will be available for sale from 15th March. The introductory pricing would be applicable for the first 30 days of sales. The Silver Proof version has an introductory pricing of $51.95 and a regular pricing of $56.95. The Silver Uncirculated version has an introductory pricing of $48.95 and a regular pricing of $53.95. The Clad Proof version has an introductory pricing of $27.95 and a regular pricing of $32.95. As per the new Act, up to 50,000 $5 gold coins made in a “pink gold” alloy made up of not less than 75% gold; up to 400,000 $1 silver coins in .900 fine, 11.34 grams, 1.5? format; and not more than 750,000 copper-nickel clad half dollar coins will be produced. A design competition was organized, in which Mint artists, engravers, and the general public were invited to participate. Three members of the Citizens Coinage Advisory Committee (CCAC) and three members of the Commission of Fine Arts (CFA) were assigned to judge the contest. The obverse and reverse designs were created by AIP artist Emily Damstra. The winning designs were announced on 23rd October 2016. The obverse design features a younger woman, wearing a head scarf and raising her right fist. An older woman has closed her eyes and her hands are placed over her heart. A breast Cancer awareness ribbon and a flying swallowtail butterfly are also featured. Other inscriptions include LIBERTY, 2018 and IN GOD WE TRUST. The reverse features a large version of the swallowtail butterfly. Inscriptions on the reverse include UNITED STATES OF AMERICA, denomination, E PLURIBUS UNUM and BREAST CANCER AWARENESS. $5 gold coin, silver dollar, and clad Half Dollar will be sold with an additional surcharge of $35, $10 and $5 respectively. After the production and sales expenses are covered, the remaining proceeds from the surcharges will be donated to the Breast Cancer Research Foundation in New York City.